This impressive memorial stands in the small coastal town of Geraldton in West Australia some 500 miles north of Perth. Only completed in 2001 it commemorates a naval battle fought on 19 November 1941 when the Australian light cruiser Sydney intercepted a German surface raider Kormoron in the Indian Ocean some 100 miles offshore from Geraldton. The Kormoron (Cdr Theodore Delmers) had left Germany in the autumn of 1940 and managing to evade Royal Navy patrols escaped into the North Atlantic disguised as a Dutch merchant ship the Straat Malakka. Between January and April 1941 Delmers intercepted and sank 8 Allied ships, before sailing round the Cape into the Indian Ocean and sinking three more ships between June and September. Delmer next planned to lay mines in the shipping lanes off the West Australian coast and it was then that he was spotted and intercepted by HMAS Sydney (Capt Joseph Burnett). Signals were exchanged. Capt Burnett became suspicious but made the fatal error of closing to only 900 metres. Cdr Delmers realising the game was up decided to fight and in one devastating salvo bombarded the Sydney destroying the rear turrets, the bridge and the spotter plane and killing Capt Burnett. Fires broke out but the Sydney gallantly fought back and tried unsuccessfully to ram the Kormoron. Nevertheless some shells found their mark causing fires to break out. In one last desperate attack Kormoron fired a torpedo which severely damaged the bow section of the Sydney. As darkness fell the Sydney broke off the action as fires were spreading out of control. The Germans saw flames on the horizon until about midnight. Meanwhile the fires on the Kormoron raged out of control and Delmers ordered the crew to abandon ship. A few days later some 315 survivors out of the crew of 399 were found drifting in their lifeboats and on their life rafts and taken prisoner. Yet despite extensive searches not a single Australian survivor was ever found. 645 men had simply disappeared. This mystery has never really been explained as the seas were calm. Only on 17 March 2008 was the wreck of the Sydney found lying at a depth of 8000 feet. The Germans were repatriated back to Germany in 1947. For Australia it was the worst naval disaster of the war. Strict censorship was imposed and relatives were given no information. After the war all sorts of conspiracy rumours and theories emerged but nothing was proved. The memorial was dedicated on 18 November 1998 and completed in 2001 some 70 years after the battle. 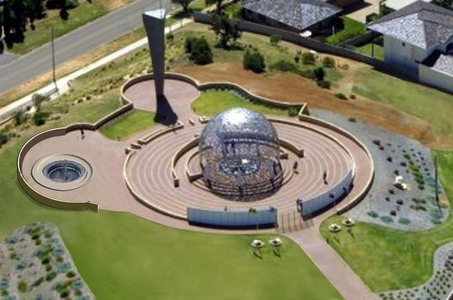 It was designed by two West Australian artists Charles and Joan Walsh-Smith and stands on a hill overlooking Geraldton. It consists of 5 elements. A Sanctuary Dome with 645 seagulls of stainless steel welded to the roof represent the souls of the lost sailors. A granite Wall of Remembrance lists all the names of the crew. Alongside is a steel shaped like a ships prow and a Pool of Remembrance together with a map showing the position of the battle as well as pictures of the two ships. Finally on the approach pathway outside is a bronze statue of a woman looking out to sea. She represents a mother looking in vain for her beloved son to return. A fitting and imaginative memorial to the brave men lost in that tragic action.